Three years after the National Football League faced a major crisis over its handling of accusations of domestic violence, the NFL’s consumer perception is overshadowed by Major League Baseball even when baseball is not being played, according to YouGov BrandIndex. Not helping the NFL get back on its feet: the notorious “Deflategate” controversy with the New England Patriots, which led to suspensions and ultimately court rulings. The accusations began after the AFC Championship game in January 2015, and the issue lingered throughout the 2016 season. All of this seemed to culminate in a difficult 2016 for the NFL, with lower television ratings than usual, accompanied by a 13-month slide in consumer perception that ran from November 2015 through the end of 2016. It was only when the Patriots looked like they would shake off Deflategate and head into the playoffs that perception began to move back in a positive direction. As a matter of fact, the NFL’s recovery has been dampened enough that MLB has dominated consumer perception metrics since fall 2014. It was only during the last two Super Bowls that the NFL has edged out MLB in consumer perception — when professional baseball is not even in season. 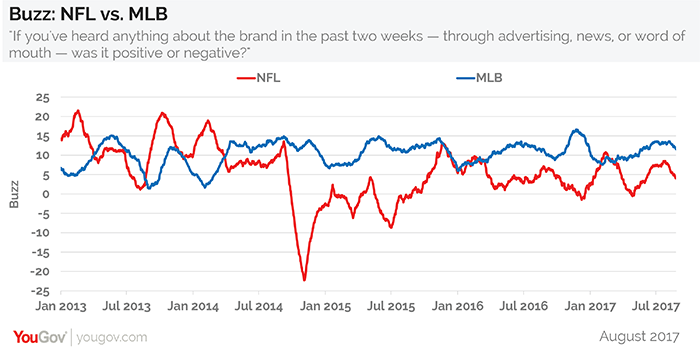 Both the NFL and MLB were measured with YouGov BrandIndex’s Buzz score, which asks respondents: "If you've heard anything about the brand in the last two weeks — through advertising, news or word of mouth — was it positive or negative?” A score can range from -100 to 100 with a zero score equaling a neutral position.